At Party Plan Divas we believe in supporting all small business owners to pursue their dreams. We also believe that it is the small details that matter, and one of the things that sets us apart is the ability to personally work with and care for each one of our customers, hostesses, team members, and even sister consultants. That is why every year I am delighted to feature my friend Denise Kondash who owns Whimsical Seasons, LLC. Since 2007 Whimsical Seasons, LLC has been offering hand painted baskets, ornaments, and other home decor that bring a whimsical charm to your home or office. Artist and owner Denise Kondash hand paints every item to order, so you know your piece is not only one of a kind, but made with love. I was so excited to open the box that Denise sent to include in this year’s Diva Holiday Gift Guide. Denise also believes that the small details matter, so even the packaging is done with little added touches – like the little “made with love” charm dangling from the Christmas colored twine bow. Inside I found this gorgeous Hand Painted Santa Lightbulb Ornament that I can not wait to hang on my tree! 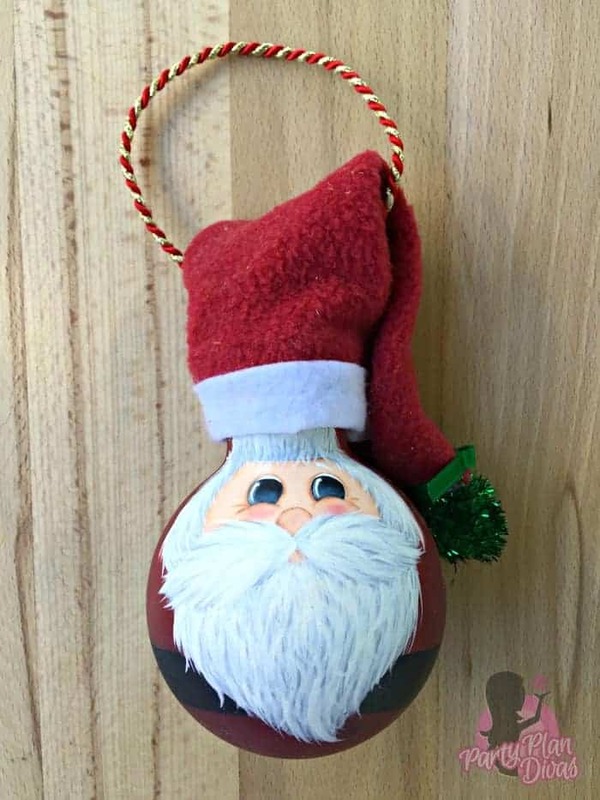 From his individual whiskers to his little mittens on the side of the bulb ornament, you can tell Denise spent time making sure this jolly little guy was just perfect! Whimsical Seasons, LLC products are a beautiful addition to your holiday shopping this season. Whether you are putting on the added touches to your customer orders, spoiling your hostesses or rewarding your team, Denise can paint up the perfect piece for you to show just how much you care. Visit her website to see all of the adorable designs she has to offer or suggest your own for her to make you a one-of-a-kind piece! No matter what you order you can know that it was made just specifically for YOU!